1. Heat oil in a pan, add cumin , curry leaves, chopped green chili, ginger gralic paste, asafoetida, turmeric powder. Saute for few seconds. 2. Add the finely chopped methi leaves, mix well. Add mango powder, sugar, salt, red chili powder. coriander powder and mix well all the ingredients. 3. Cook this around 8-10 mins so that all the bitterness of methi reduces. Keep it aside. 4. In a mixing bowl sieve the wheat flout and gram flour. Add curd, melted butter, salt. 5. 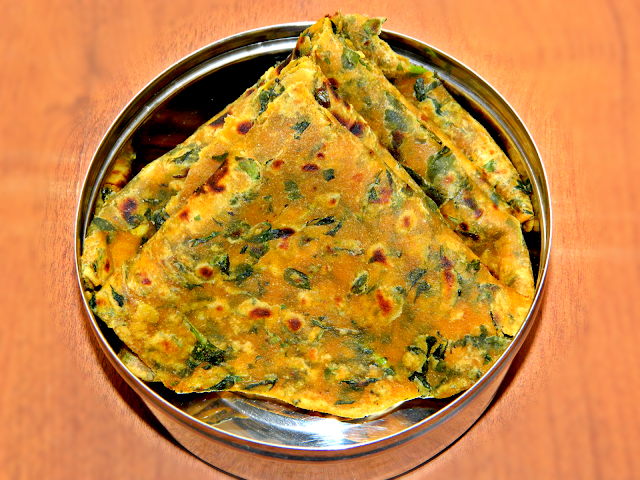 Add the prepared methi sabzi, pinch of turmeric powder and prepare smooth dough by adding little oil and required quantity of water. Keep this a side for 5 mins. 6. Take small round balls of dough and spread it like chapati. 7. Heat frying pan, sprinkle little oil and toast the spread parathas. 8. Server this hot with curd / pickle. 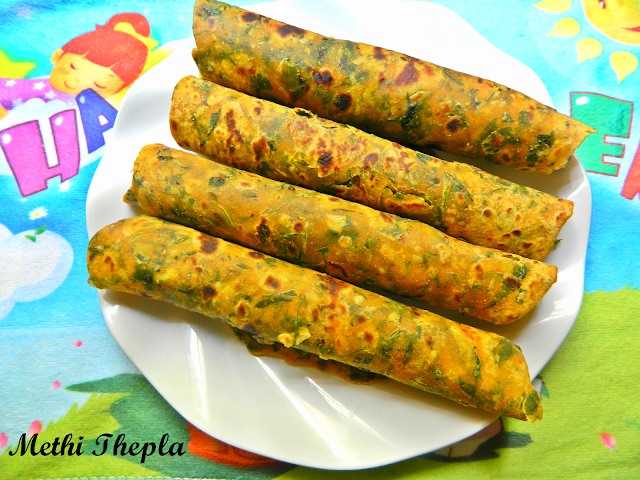 Adding gram flour is optional, it some times makes thepla's hard. But since I add curd & butter together it makes them soft. Adjust the quantity of red chili powder based on your taste. You can squeeze a lemon slice if you do not have mango powder.